For the Australian locality, see St John's Wood, Queensland. St John's Wood is a district in the City of Westminster, London, lying about 2.5 miles (4 km) northwest of Charing Cross. Much of the neighbourhood is covered by a Conservation Area, a small part of which extends into neighbouring Camden. 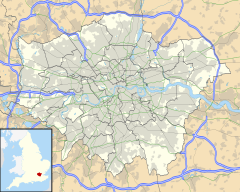 Traditionally the northern part of the Ancient Parish and Metropolitan Borough of Marylebone, it extends east to west from Regent’s Park to the Edgeware Road, with the Swiss Cottage area of Hampstead lying to the north. Once part of the Great Middlesex Forest, it was from 1238 a wooded farm of St John's Priory, Clerkenwell (the Knights of St John of Jerusalem) before Protestant Edward VI of England sold the farm to noblemen. It is an affluent neighbourhood, with the area postcode (NW8) ranked by Forbes magazine as the fifth most expensive in London based on average home prices in 2007. According to a 2014 survey, St John's Wood tenants pay the highest average rent in London, with rents averaging £1,889 per week. The great landholding of St John's Priory (i.e. Clerkenwell Priory) lying nearest London until Protestant monarch Edward VI of England was St John's Wood Farm. This was equivalent to today's area in what was then the north of Marylebone. It had the estate farmed out on agricultural tenancies as a source of produce and income. Edward saw the farm divided and sold to wealthy noblemen. A map showing the St John's Wood ward of St Marylebone Metropolitan Borough as it appeared in 1916. St John's Wood developed from the early 19th century onwards. One of the first developers was James Burton. It was among the first London suburbs with lower-density villa housing and frequent avenues, but fewer communal garden squares. Most of the villas have since been subdivided and replaced by small apartment blocks or terraces. This pattern of development has made it one of the most expensive areas of London. St John's Wood is the location of Lord's Cricket Ground, home of Middlesex County Cricket Club, the Marylebone Cricket Club (MCC), and the original headquarters of cricket. It is also famous for Abbey Road Studios and the street Abbey Road, where The Beatles recorded, notably the Abbey Road album, the cover of which features the band crossing the road. The King's Troop, Royal Horse Artillery was formerly based at St John's Wood Barracks. The regiment moved to Woolwich on 6 February 2012; the barracks has been demolished and the site developed as upmarket housing. The area is also home to St. John's Wood Church Grounds, which contains the only nature reserve in the City of Westminster. For education in St John's Wood, see List of schools in the City of Westminster. St John's Wood has a range of places of worship. The nearest London Underground stations are St John's Wood and Swiss Cottage on the Jubilee line; Maida Vale, Marylebone and Warwick Avenue on the Bakerloo line; and Baker Street on Bakerloo line, Jubilee line, Hammersmith & City line, Metropolitan line and Circle line. The nearest London Overground station is South Hampstead. Keith Richards – rock musician and songwriter of The Rolling Stones lived on Carlton Hill in the 1960s. Henstridge Place and Woronzow Road London NW8 featured in the “Give Us This Day Arthur Daley’s Bread” episode of the popular U.K. television series Minder. Count and Countess Fosco live at No. 5 Forest Road, St. John's Wood in Wilkie Collins's 1859 sensation novel The Woman in White. Irene Adler lives there (in Briony Lodge on Serpentine Avenue) in Arthur Conan Doyle's 1891 Sherlock Holmes story "A Scandal in Bohemia". In the first instalment of John Galsworthy's The Forsyte Saga, The Man of Property (1906), Young Jolyon lives on fictional Wistaria Avenue with his second wife and family. St John's Wood is the home of fictional characters Bingo and Rosie Little in P. G. Wodehouse's Jeeves and Wooster short stories and novels, written from the early 1920s onward. Referenced in the Rolling Stones song, "Play with Fire", released in 1965. The protagonist of J.G. Ballard's novel Millennium People (2003), is a psychologist who lives in St. John's Wood, which he abandons to join a middle-class rebellion. Appears in two books by Howard Jacobson, as the setting for his 2004 book The Making of Henry, followed in his 2010 Man Booker Prize winning novel The Finkler Question as the planned location for the Museum of Anglo-Jewish Culture. Violet Hill, a street and area off Abbey Road with Violet Hill Gardens and Violet Hill Hospital, is the source of the name in Coldplay's 2008 song "Violet Hill". Due to the conveniently close location to Elstree Studios, (just over 10 miles), St John's Wood was used extensively for location shooting for many of the ITC adventure shows of the 1960s and 1970s, including The Saint (TV series), Randall and Hopkirk (Deceased), The Persuaders! and Return of the Saint. ^ "Camden Council: St John's Wood (East and West) conservation area appraisal and management strategy at 1.1 measures "3.83 hectares" otherwise the area is in Westminster and at 5.3 "Eyre's estate" [approximately equal in size] measured 500 acres". Retrieved 27 March 2018. ^ a b "Westminster Council: St John's Wood Conservation Area Appraisal: 3.6 Sale of land in St John's Wood by the Crown began in the early 18th century. Henry Samuel Eyre acquired the largest portion in 1732: a 500 acre estate that stretched roughly from what is now Rossmore Road to Swiss Cottage, bounded by Hamilton Terrace to the west and Avenue Road to the east" (PDF). Retrieved 27 March 2018. ^ Sherwood, Bob (7 April 2010). "Affluent enclave sitting on political front line". Financial Times. ^ "In Pictures: London's Most Expensive Postcodes". Forbes. ^ Prudence Ivey (20 November 2014). "St John's Wood tenants pay the highest rent in London - Hampstead & Highgate Property". Hamhigh.co.uk. Retrieved 7 June 2017. ^ "Celebrating the birth in July 1761 of James Burton, the founder of St Leonards-on-Sea and builder-developer in Bloomsbury". Victoria County History. 29 July 2011. Retrieved 7 June 2017. ^ "U.K.'s Most Expensive Postcodes". Forbes. 12 December 2007. Retrieved 25 May 2012. ^ Ross Lydall (6 February 2012). "Final salute: St John's Wood bids farewell to the King's Troop after two centuries – UK – News". Evening Standard. London. Retrieved 25 May 2012. ^ Anthony Quinton. "ALFRED JULES AYER". Ucl.ac.uk. Retrieved 7 June 2017. ^ a b c "St. John's Wood". Cwhr.co.uk. ^ Prudence Ivey (10 November 2014). "For sale: Monty Python star Eric Idle's St John's Wood house - Hampstead & Highgate Property". Hamhigh.co.uk. Retrieved 7 June 2017. ^ O'Toole, Leagues (2006). The Humours of Planxty. Ireland: Hodder Headline. ISBN 0-340-83796-9. ^ Fusion Advertising & Design. "Area Guide to St John's Wood – Property guide to St John's Wood from". ludlowthompson.com. Retrieved 25 May 2012. ^ Mendoza, Nadia; Eriksen, Alanah (10 October 2011). "Paul McCartney and Nancy Shevell wedding: Kate Moss and Ronnie Wood last to leave". Daily Mail. Retrieved 25 May 2012. ^ a b Siobhan Mcfadyen (3 June 2011). "Inside the home Kate Moss can't sell: What's putting buyers off – the flooding? Location? Or is it the jungle-themed living room?". Daily Mail. Retrieved 25 May 2012. ^ Jonathan Prynn (15 October 2014). "Rupert Murdoch's daughter buys home in St John's Wood for £38.5m after split from husband Matthew Freud". London Evening Standard. Retrieved 7 June 2017. ^ Detailed in Richards' 2010 autobiography, "Life"
This page was last edited on 20 March 2019, at 01:14 (UTC).